Welsh International Lee Edwards, once again, showed his class on running water to finish inside the top 10 on the second annual River Wye two-day Spring festival held on the prolific Belmont stretch at Hereford. The event was created by Tricast man and 2017 Match This finalist Dave Roberts and proved an instant success with the competition selling out in just a couple of hours after tickets were announced. Unfortunately, however, some freak weather overnight after the opening day led to the second day being cancelled much to everyone’s disappointment. However, conditions for this year’s event were much improved with levels and water colour being near perfect. Leading up to the event the river had been running consistently high at around 6ft up, but with a couple of days of dry weather before the first day, the river was looking good. Come the opening day of the competition, levels were around 2.5ft up and the river looked superb. Lee looks back on an event of two halves which saw him top a talented field after the opening day, but then draw out of the fish on the second day. “For the opening day of the event, I drew a peg that I’ve always wanted to fish – peg 96 – the end peg on the Belmont section, just below the rowing club where the match length leads to the tennis courts section. Peg 96 used to be a great peg, but now it’s a bit hit and miss and it’s been some years since it’s won a match. Where as small chublets used to be resident, now you’re hoping for quality chub to move up from the pool below the old stone bridge where you can’t fish“. “I started off balling six balls of groundbait to see if any fish were in the peg as, generally speaking, the fish come to the noise. Unfortunately, on this occasion at least, it didn’t have the desired effect. So, I opted to fish 3/4 the way across the river with bread on the hook. Again, nothing“. “By this stage in the day, I was now an horr in and all I had to show for my efforts was a Salmon parr. I decided to up the feed in an effort to pull the fish up from the pool below as there was nothing in front of me. Fifteen minutes later and I hooked my first chub on the waggler close to the bridge stantions. At around 4lb or so, this was the size of the stamp I had been expecting. I picked a few fish off over the next two hours, nothing frantic, just odd bites but they were coming regular enough to make it worth while running the float all the way to the end of the swim“. “It was noticeable that as I was dragging line on the bottom and the float was in front of the hookbait. If I stopped the float to make the hookbait go in front of the float, then let it go to run again, this generally brought a very quick response. Some I hit, some I missed. I lost a few in weed and lost a large barbel that was fowl hooked after not being able to move it much after about twenty minutes. All my fish were hooked just around the mouth with nothing being hooked deep, which told me they weren’t feeding positively“. “Come the end of the first day all my fish had come to the waggler with line on the bottom. I had no bites running it off bottom or any bites on the bulk shotted bolo / stick rigs. I’ve had a fantastic days waggler fishing taking chub to 5.8lb along with three beautiful roach to win the day with just over 57lbs. Choice of line for the day on the waggler was the new 0.18 MV-R Carp Feeder. Reason I chose this is because of its low diameter and durability. It is a sinking line, but sprayed with liberal amounts of line floatant, it performed well. Hooklength material was 0.16mm to a size 16 Katana hook. I used the exact same set up to win the Wye Championship last year and fed a total of eight (8) pints of maggots and three (3) pints of hemp“. “After such a fantastic opening day, the wheels fell off for me on the second day and it was all over at the draw really. I drew a terrible peg on the day, which was badly affected by the freezing Easterly winds with the temperature having dropped six degrees overnight. Not much I can say about peg 55. The fish stayed down by the rowing club pegs around the mid 60’s“. “my set up for the day remained unchanged from the previous day with the exception of a pole line to fish chopped worms for perch. I endured a very uneventful day which resulted in just a single bite producing a small chub after the first hour and that was that! There were blanks everywhere compared to the excellent day’s fishing the day before“. 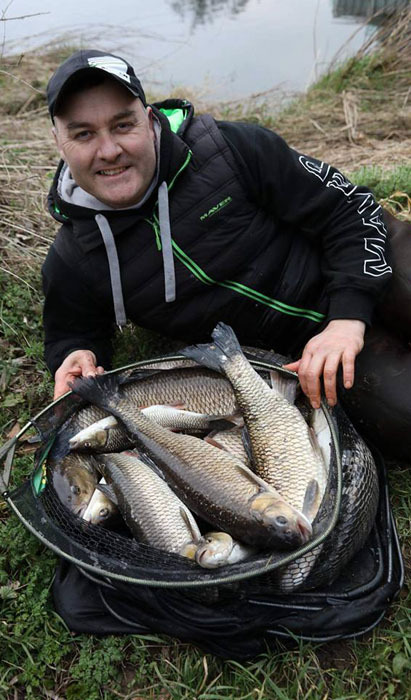 “My chub went 1lb 4oz, which was 8oz off winning the section and ultimately cost me the festival. You can only work with the pegs you draw. I don’t let it get to me in any way“. “On to the next one“!